Imagine you are the Building Owner or Property Manager of a commercial building that is listed on the National Register of Historic Places, and one day you learn that a public transportation project is planned that could likely impact the stability of your building. Especially if the building has a degrading underground sidewalk vault, which is out of sight and out of mind! Do any of your properties have a sidewalk vault, what type of risk or liability can be associated with maintaining a sidewalk vault; and what should you do to protect your property? What is a sidewalk vault? Sidewalk vaults are a partial extension of a building’s basement under the adjacent side walk. They can extend up to and sometimes beyond the curb under the roadway. Introduced in the 19th century in urban areas, they were the equivalent of loading docks today, and are often still in use. These vaults were typically on city property and building owners maintained them and paid a tax for their use. The vaults allowed access to utilities and delivery areas without entering the building. Common sidewalk construction consisted of a 4″ topping slab or brick pavers on a waterproof membrane on a 4″ to 6″ structural slab spanning between steel or concrete beams or masonry arches. Before electricity, cast-iron and precast panels were fitted with glass lenses to allow daylight to reach otherwise dark vaults. Another common top consisted of 6″ to 8″ granite panels without waterproofing. Curbs were often faced with steel plate to protect them from vehicles parked on or driven over them. How do sidewalk vaults present potential risk or liability? Sidewalk vault slabs constructed in the 19th century lacked the drainage and waterproofing details in use today. If waterproofing membranes were used, they were typically poorly installed and/or not easily maintained. They also did not allow for drainage at the membrane level. Decades of slow water migration into the slab resulted in freeze-thaw damage and corrosion of reinforcing and support steel. With the decline in usefulness, sidewalk vaults have been neglected to the point that their structural integrity is in question. Additionally, in the 19th century sidewalk slabs were built prior to modern building codes and were intended to support pedestrians. Today’s building code sidewalk loading criteria is intended to support parked trucks. 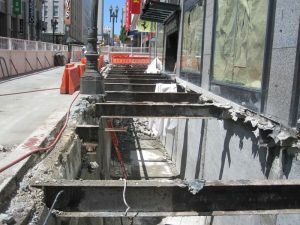 Sidewalk vault degradation is commonly out of sight and out of mind. They are not subject to ordinances similar to those for building facades and fire escapes. Often, the unsafe conditions are discovered by accident or partial collapse thus exposing building owners to tremendous liability and significant cost. Building Owners and Property Managers should consider hiring a structural engineering firm with expertise in failure analysis and experience in the evaluation of sidewalk vaults to perform a structural condition survey. The purpose of this survey is to assess the condition of structural framing, sidewalk slabs, and basement walls along the perimeter of the subject building. Innovative Engineering Inc. structural engineers are experts in failure analysis and have extensive experience with inspecting and analyzing sidewalk vault conditions. We typically recommend a phased approach consisting of a cursory condition assessment followed by other phases that may include closer examination, analysis, or improvements as necessary. In this manner, building owners are able to better control their expenditures, risk and liability.